From the first moment you catch the fragrance of Philadelphus varieties you will be looking for varieties that will suit your garden. And with both smaller growing and large shrub types you will be spolit for choice. Your choice will depend a little on you climate, however these are easy care and adaptable plants, and that wonderful orange citrus fragrance they are suited to all but arid areas and tropical climates. For warmer climates look for Philadelphus mexicanus ( Mexican Mock Orange ) which is an evergreen species with beautifully scented white flowers in summer, while Philadelphus coronarius prefers a little shade. 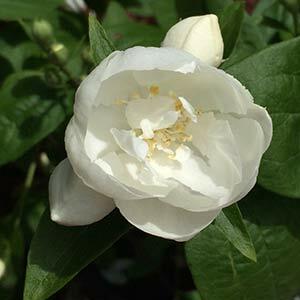 As for the best varieties, look for Philadelphus x virginalis, a very popular cultivar. We like the larger flowering Philadelphus Beauclerk which has flowers to 6cm, while Philadelphus Manteau d’hermine is a dwarf form, very compact. Some varieties have attractive peeling bark, others more elegant flowers as well as fragrance. P. Coronarius aureus is a variety with paler lime green foliage, masses of small flowers and it will, grow well and bloom in light to medium shade. Grow philadelphus in full sun to partial shade depending on species, and the climate. Prepare the soil by digging over well and adding some aged compost and a little cow manure. Fertilise each spring with a slow release all purpose fertiliser or a good organic fertiliser. Top dress with a little cow manure each spring and top up the mulch. Philadelphus mexicanus is the Mexican Mock Orange and is a vigorous plant that in good conditions can get to 5m + in height. This is one of those popular shrubs, evergreen and with masses of flowers from spring through to summer. The flowers although smallish, are a creamy white, fragrant and along with mid green foliage the Mexican Mock Orange is a good plant in a place where it has the room to scramble. Be aware that this is a plant that can ‘take over’. We have seen it almost smother a 4m high camellia so for a small space it is not the best solution unless you are prepared to cut back hard every year or two. You can happily prune Philadelphus mexicanus right back to .5 m above the ground if needed. In fact we strongly suggest you do keep this one in check, especially in warmer climates, and even more so in smaller spaces, where it can be a bully. Philadelphus belle etoile is one of the more compact growers, and with large white flowers through spring and summer is an excellent easy care plant for the garden. Although it is a smaller shrub than many of its relatives it is still in need of a little space.The long arching canes require a space of around 2m in width to perform at their best. A humus rich fertile soil is best. Full sun to part shade and a little water until established. After a year or two you will find that Philadelphus ‘Belle etoile’ is almost ‘bullet proof’, drought tolerant and if you need to it can be pruned back hard. The only real problem is a poorly drained soil. Plants can be cut back after flowering to around 1m, or right back to the ground for a new less of life. Philadelphus ‘Beauclerk’ with its white flowers sometimes pink to red centred this is a cottage garden favourite. This is a deciduous species with long arching canes. Like most Philadelphus it can be pruned back hard after flowering to keep in shape.